Success has many fathers and with the Global Integration Bootcamp that is a fact. Organizers, speakers, companies hosting the event, the Microsoft Pro-Integration Team, and above all the attendees. This global event showed how passionate, strong and active this integration community is! The motion10 has an amazing view over Rotterdam, which you can see in two of the video interviews. In holland we kicked of at motion10 HQ at the same time as some of the other locations in Europe. Our friends in New Zealand, Australia and India just completed there day. At motion10 Gijs kick off the day followed by Tomasso presenting on API Management. After Tomasso session the attendees dive into the first lab. The requirements to do the labs yourself can be found here and the labs will be published soon in an eBook by BizTalk360. The second session was done by Rob Fox on Hybrid Integration including working with the on-premise gateway. During the lunch people continued with their labs, followed by the third talk by Eldert, who continued with the hybrid integration story. This story included the connectivity through Logic Apps with on-premise BizTalk Server. 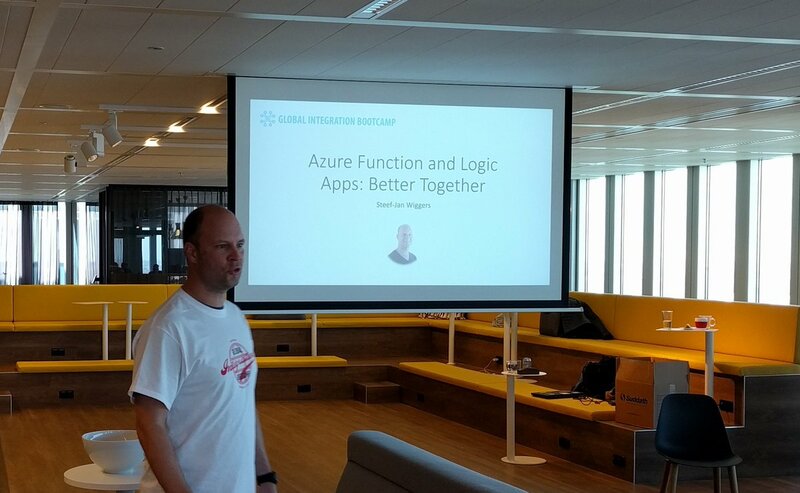 My session, number four, was to showcase some great Azure services like Logic Apps and Azure Functions. It was fun to do as I was able to show my trumpizer demo again. The final session of the day was about IoT and done by Eldert again. I am proud to be able to be part of this great event and journey to it. Loved the close collaboration with Eldert, who has been a key factor in organizing this event. His passion and drive is amazing and his recent MVP award is well deserved as it is a crown of his dedicated work for the community. And this something that I like to point out as his mentor. Well done buddy! Thanks from the Dutch speakers #gib2017 and see you next year at #gib2018!